Please join us in a new location for the Fire Mountain Holiday Party! This year the 7th annual gathering for all residents of Fire Mountain will be held on the Lanai at 1733 Downs Street, Sunday, December 11 at 5pm. With a covered patio and a warm fire this year, we hope you will join us in meeting your neighbors and kicking off the holidays. Bring an appetizer or dessert and a beverage of your choice. Hot cocoa, cider, and a special hot toddy will be provided. Please be sure to tell at least one friend in Fire Mountain – it’s the neighborly thing to do! Many Fire Mountain residents received notice that a new offices will be built at the corner of Jefferson and Vista Way. In the past this lot was a Datsun auto dealership, a Saturn dealership, and most recently has been the temporary sales lot for Christmas trees, a pumpkin patch, and a bouncy house park. Check out the image below for more details and let us know what you think in the comments section of this post. The Friends of Live for Logan are pushing forward on traffic calming measures in Oceanside. The Pilot Traffic Calming Program is on the agenda for Wednesday, January 20 at 6:00 pm. The group says the program will make it safe for bikes and pedestrians to cross between North and South Oceanside by adding a buffered bike lane and a mid-block crossing, as well as reducing and slowing traffic. This is a temporary solution until the process for permanent improvements is completed. You don’t have to speak. Your presence alone is very important. We anticipate opposition to the bike lane and the cross walk. It is important for City Council to see that many Oceanside residents, parents and business owners support safe passage. If you have questions about the Pilot Program, check out the Q&A below. Here’s your chance to clear out all those electronic things junking up your garage, before the holidays bring you even more clutter. Palmquist Elementary School and Urban Corps of San Diego are hosting a huge recycling event today. In the Palmquist Parking Lot at 1999 California Street. They will be accepting: Bagged Gently Used Clothing, E-waste, Toner/Ink Cartridges, CRV Bottles and Cans. Categories: Events, Meetings and Events, Uncategorized | Permalink. 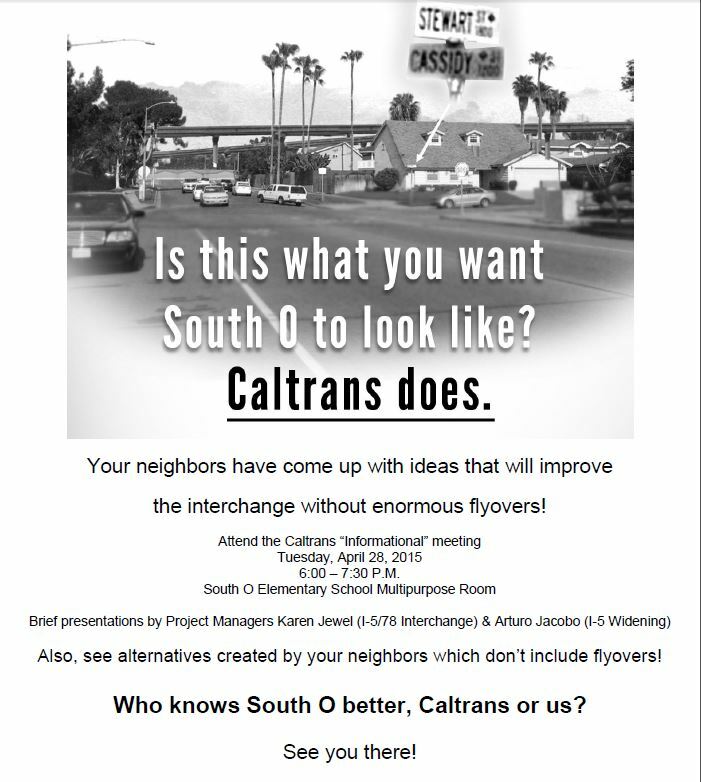 Don’t miss the Caltrans “Informational” meeting discussing plans for the I5/78 interchange and widening projects. The City of Oceanside is introducing a new program to Fire Mountain residents. 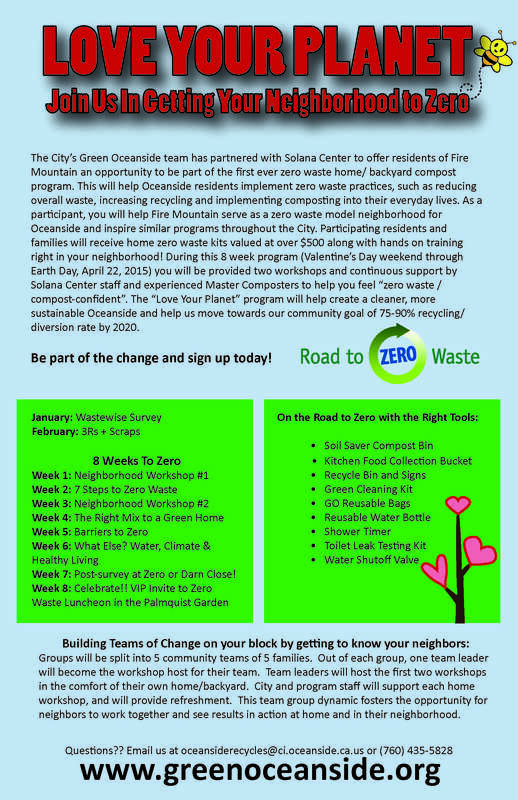 The City’s Green Oceanside team has partnered with Solana Center to offer residents of Fire Mountain an opportunity to be part of the first ever zero waste home/ backyard compost program. 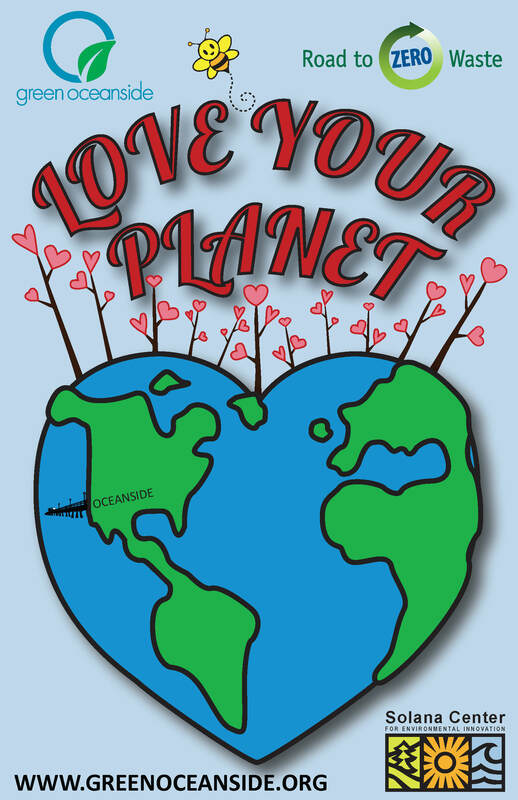 The program was created to help Oceanside residents implement zero waste practices, such as reducing overall waste, increasing recycling and implementing composting into their everyday lives. Fire Mountain has been chosen as the neighborhood to represent a zero waste model to inspire similar programs. This is an 8-Week program that provides continuous support, hands on training, and a zero waste kit valued at over $500 to get you started. There will be a representative on-hand at the Holly Jolly on Molly, Sunday December 7th with more information about the program as well as sign up opportunities. With the success and recognition the Green Team and Zero Waste initiative at Palmquist Elementary, it makes sense that the adults in the neighborhood would help make the community a role model for other neighborhoods and cities. Only 5 teams of 5 families will be chosen to participate, so check out the flyer for details and sign up to be a part of the change in Oceanside! 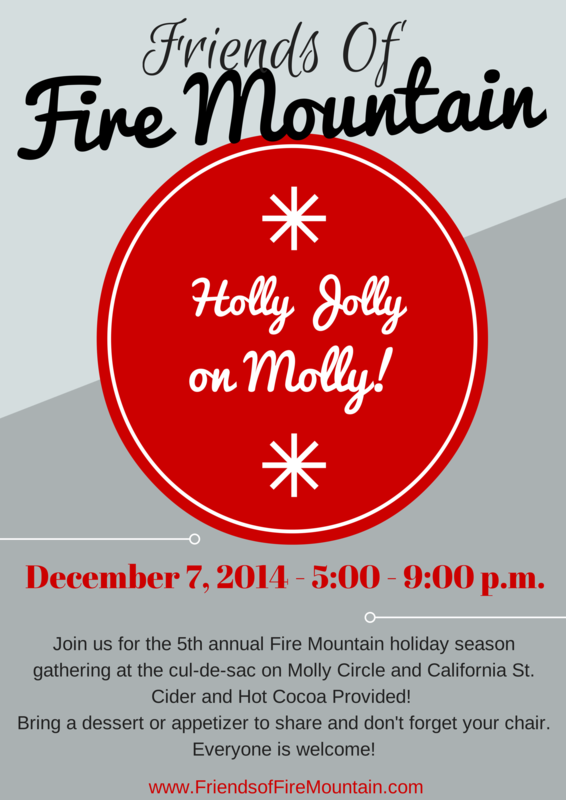 Join us for the 5th annual Holly Jolly on Molly holiday block party! When: December 7th, 5:00-9:00 p.m.